Ashley Township High School "Wolves"
Ashley (population 613) is located in eastern Washington County in southern Illinois. It is located on Illinois Route 15 just west of U.S.Route 51. This would place Ashley about 12 miles south of Centralia and 16 miles west of Mt. Vernon. The town was named after one of its early settlers, John Ashley. Two major railroad lines, the Illinois Central Gulf and the Louisville & Nashville, intersect in town. A branch of the Muddy Creek also runs into town. 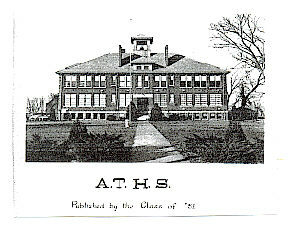 "The original building has been torn down except for the gymnasium. 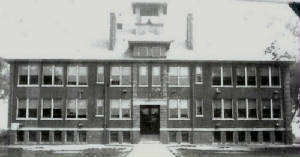 In the old building, the High School occupied the second floor, and the Grade School, had the first floor. The basement of the school housed the cafeteria, band room and 7th and 8th grade class rooms." It was in 1972 that the folks of Ashley decided to deactivate their high school. At this point the high school aged students of Ashley were (and still are) bused to nearby Nashville to attend High School. Ashley residents maintained control of their Grade School however, and Ashley Grade School still serves the children of the town today for grades K - 8. Run right down that floor. Ashley High School attained athletic success in boys basketball and boys track & field (www.ihsa.org). It is possible that baseball and football were also offered at the school at some point. Of the many seasons that Ashley High competed in sports, there have to be many items worthy of mention on this page. If you have this information and would like to share it please send us an e-mail. 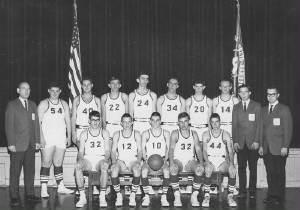 The Ashley High School boys basketball team put together back to back District title years in the early 1960s. This is usually attributed to a great class or great coach. Unfortunately coaches names and team records of these and other great AHS teams are not available. The years of the District title teams are listed below. Two Ashley High School athletes brought home medals from the IHSA State Track Meet. One of them, Harold Hartley in 1943, was even crowned State Champion in the High Jump! Jerry Spear paved the way for Ashley tracksters placing 5th in 1941 in the 200 yard hurdles. Jerry also laid claim to being the first kid at Ashley to play four years of varsity basketball, making the varsity team his freshman year! The years of the great efforts of these two boys are listed below. 1942-43 Harold Hartley High Jump STATE CHAMPION ! !